Works of art — whether abstract or literal depictions of reality — expand the mind. Nonverbal by nature, visual art erases barriers allowing communication to flow unhindered by nationality or language. Both creating and viewing art are ways of spending time that cause no harm and make life as a human meaningful. It follows that young people should have significant exposure to visual art as part of their education. However, not all teaching methods meet the needs of children found in an educational setting, so the quality of art instruction warrants examination. 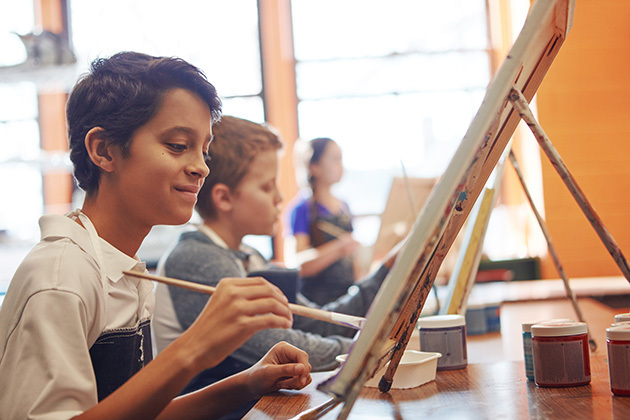 Under the scrutiny of cynical parents or superiors who expect to see artwork that subscribes to a certain aesthetic, art teachers frequently feel the pressure to justify the value of their class with student artwork that meets these standards. In turn, they may push students to produce rather than explore. Commonly, children are labeled as talented or untalented early on. The so-called gifted ones receive more attention and become the yardstick to which the others are expected to measure up. This creates undo competition between students, stifling true creativity and independent exploration. "Art class isn't just for students who have an affinity for art or are considered talented," says Gaby Hernandez Rojas, an art teacher since 1995 who currently teaches in primary and secondary. "Everyone gets a lot out of just interacting with the materials in a creative way." By running her classes more like art workshops than traditional art lessons, she takes the emphasis off making beautiful art. This allows all students to enjoy the process of making art in their own way. "It's not an art academy, we're not looking for perfection," she asserts. I asked students who have art weekly at school if only the artistic members of their class like it. One sixth-grader responded that the majority of her classmates enjoy art class regardless of talent. A 10th-grader shared that while her drawing and painting aren't particularly strong, she's discovered that she loves doing collage. Creating a workshop-like environment doesn't mean anything goes or the teacher has no role in the classroom. As alluded to above, teachers can enrich lessons by introducing a wide variety of art methods, techniques and materials. For example, demonstrating various ways to use pastels or acrylics is more valuable than telling students how and what to draw or paint. Along with the technical aspects of teaching art, teachers often need to take on the role of coaches encouraging children to explore and let go of preconceived ideas of how things should look or whether they are "good" artists or not. Going against the talent tide is a tough challenge teachers face when students themselves start to rank themselves against their peers. Russian painter Wassily Kandinsky is quoted as saying, "There is no must in art because art is free." Creating an atmosphere without musts, expectations or unnecessary rules is one of the best ways art instructors allow students to reap the most out of their art experience. My first teaching position was as an art teacher at the preschool and primary levels. One thing I'll never forget was how as early as kindergarten, children would judge what they did as bad or tell me that it didn't turn out. Some would want to start over and others just give up. It took me by surprise how they already had such high expectations of themselves and had lost the pure joy of creating by such a young age. I asked Hernandez Rojas how she has dealt with student self-criticism. To begin with, no erasers are allowed in her class, and she makes it clear from the outset that the class is about self-expression, not perfection. When students say what they did is ugly, she'll challenge them to look at their expectations and their conceptions of ugliness and beauty, asking where they see something ugly in their work. "Creating art should be enjoyable because you expressed yourself," she reminds them. Another area Hernandez Rojas feels is important is art appreciation. Exposure to all types of paintings and drawings from various time periods gives students the opportunity to develop skills of observation and expands their world view. In line with her views are findings from a study of more than 10,000 students from Arkansas who visited an art museum for the first time. After only an hour-long tour where approximately five pieces of original artwork were discussed, measures of their level of critical thinking and tolerance toward people different from themselves were higher than students in the control group who stayed in the classroom. The results showed even greater benefit and impact on children from rural and high-poverty schools than the others. "All children should have access to art in all schools at every level," reiterates Hernandez Rojas. "Children who have contact with art are healthier in every way." In Part 3 of this series, we examine the benefits of involving school children in dance.